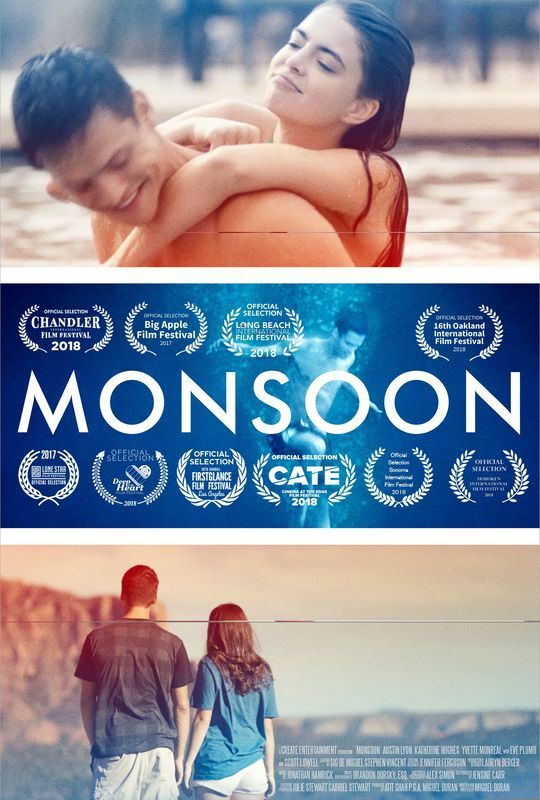 Monsoon - Teaser Trailer from Miguel Duran on Vimeo. Everybody has stories of the one that got away. Something we could have said or done differently in hindsight. It's as common as the stereotypical Arizona sunsets. But what happens when that someone didn't just get away - she died. What if you had your entire life to make something happen with that person, you finally do, and suddenly they are gone. This is where protagonist John (Austin Lyon) finds himself, when after an entire childhood as friends, he looses the woman he loves in a car accident - shortly after they finally confess their love for one and other. What a brutal twist of fate. A cruel twist indeed. You would imagine that I've pretty much summed up the entire plot at this point. John and Sarah (Katherine Hughes) were soul mates. Best friends growing up until finally it happened. They were more. Meant to grow old together. Monsoon however, has a different path ahead because as John grieves the loss of Sarah, something magical happens. She appears. Not in some sketchy, shadowy way, rather full out in your face like she never left. Of course, she is just in John's head. This isn't a ghost story... or is it? At the end of the day it's Sarah's ghost that John needs to let go of to move forward. As John attempts to move on, kind of, he has to come to terms with what happened. This is the story Monsoon tells. One of loss and grief and maybe... some form of redemption. The journey through this film is an expected one. Perhaps more than a little stereotypical. The loss. The inevitable 'other' woman introduced and finally, the satisfying conclusion. Within the first act of this title, some really hefty promises are made to it's viewers. That first act was a powerhouse that became a little difficult to maintain. Never mind the cliche elements of the story, never mind some excellent performances backing the script, there was just something slightly off about this title. In my eyes anyhow. Maybe other viewers will have other opinions. This one just happens to be mine. Austin Lyon and Katherine Hughes together, did a splendid job with their roles. There was a chemistry that was enough to make them 'feel' right together. Perhaps a little to much chemistry though, because the other woman, Caitlyn (Yvette Monreal) was forced to follow in that chemical footstep. The truth is that she performed excellently, but never did quite match the chemistry Lyon and Hughes possessed together. Looking back at this title now, I wonder if the roles had been reversed for the 2 woman, what the results would have been? Rounding off the leading cast members decent performances, was an excellent supporting role played by Eve Plumb as Gale. Plumb really did shine and even outshine - at times - the leading cast members. Where Monsoon did suffer a little, for myself, is inexplicable. It felt a little drawn out sometimes. Maybe a little scripted story-wise. I really can't put my finger on any 1 reason. It just didn't completely 'move' me the way it was probably meant to. The only concrete explanation for my dragging thoughts on this title, would be a bit of everything. Maybe a little much scenery in the edit. Maybe a hollow line scattered here or there. I really don't know, aside from it just didn't get to me. Monsoon isn't a bad film. Visually it looks great. When writing about the cast performances, I don't have much negative to write. It just wasn't my thing I suppose - but still a totally above average title. Miguel Duran's dramatic entry is easily watched in the moment, just maybe not water cooler talk for the week. Three stars.